I’m not very good at meditating probably because I’m not very good at sitting still. 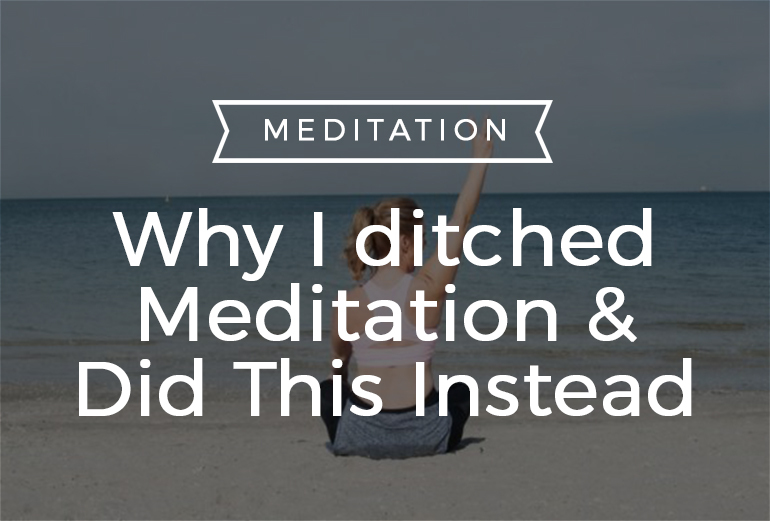 Every single damn time somebody would mention the word ‘meditation’ I’d roll the eyes in the back of my head – I envied those who could meditation. I wish I had their determination, strength, willpower… stamina. I saw people change their lives with meditation yet it was all a little too much for my exploding mind. Truth told, I had very little desire to meditate because it seemed so flipping hard but always happy to pile more on my plate. Always. I was lucky enough to be introduced to Emily Fletcher, a now friend who helps people ‘do less to achieve more.’ I’ve shared her with you before here. With my rapidly ever-growing plate that I seemed determine to keep piling up I realised something had to change and she gave me answers. I knew meditation was part of the answer yet I wasn’t disciplined enough to do it because my simple brain thought meditation was about powering it all down, quietening the mind, pulling out the plug and disconnecting and if I couldn’t do that, then I was failing at meditation. Plus, that just didn’t appeal to me. I know many of you feel like I do. I know because when I talk about meditation on Instagram, I see you all fall asleep – I see it (big brother is always watching). But over the past six months or so, I discovered something. I found through my own curiosity something magical that has been working for me and I think it would be a massive crime not to share that with you. As simple as what I’m about to tell you, I should have known that it would be something really basic that could change my life. Because simple works. Because less is best. Because we need to do less to achieve more. I discovered that rather than powering down, switching off and trying to disconnect, connecting with what was going on around me span my dial. It wasn’t about unplugging. It was about plugging in. For me, simply focusing on my breath wasn’t working. I found what worked for me. I currently feel like I’ve tapped into a parallel universe with how magical this process has made my life of late. I confess, I’m totally addicted to this practice and when I feel the pull of life getting too much I’ve become that person who says, “eep I need to meditate!” (if that’s what we can call this?) I’ve done it on the toilet, sitting in my car, at my desk, on a plane but my most favourite place to do it is on my couch when the sun rises right before the rest of the house wakes up. It literally takes me 5 minutes and it makes me set my intentions for the day. Do you have your form of meditation that works? What has been your experience? I’d love to learn! Please leave your comments in the comment section below – I want to understand what works for you too. I know I go on about the membership and that’s because it’s so darn special. It’s my happy place and the happy place of many women who come and join together to help each other out. To offer support, advice and guidance too. The membership also offers you all sorts of exclusive treats including special never seen before content and live chats with me also. It’s just another way I get to help you. I feel very privileged to be able to do so. You can try on the membership for just $1 (for 7 days). Worth a look if you ask me! Click below and learn more.